Although most of vintage 2017 has been warm and dry, the season had a bit of a late start. We had budbreak in late April, about two weeks behind average for our site. April showers continued well into May, so when the sun finally came out, the canopy filled in quickly. The vineyard reached 50% bloom on June 24. This is a significant milestone, as harvest for the Pinot Noir will occur about 110 days from that stage, around October 12. Once summer weather arrived in mid-June, we racked up the growing degree days, catching up with 2016 by August. The next growth stage, 50% Veraison, occurred on August 28, supporting our estimate of an October 12 harvest date. Grapes for sparkling wines are harvested a bit earlier to capture the naturally higher acidity. For these wines, we are looking for sugar levels in the 18-20 Brix range, compared to 21-24 Brix for the table wines. 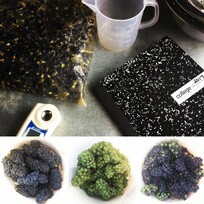 The photo above is from our first round of sampling and testing the sparkling varieties for ripeness on September 6. 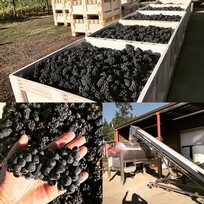 Our sparkling harvest began on September 15, with the Pinot Meunier (the image to the right is of the Pinot Meunier harvest) and the Muscat. The Chardonnay and Pinot Noir were picked on September 17, followed by Pinot Blanc on September 24. We also received fruit from vineyards in Banks, Dundee, Gaston and Yamhill.